Family entertainer for childrens birthday Parties,Lets Get Your Party Started! If you're looking for some amazing entertainment for your special event, you've come to the right place. 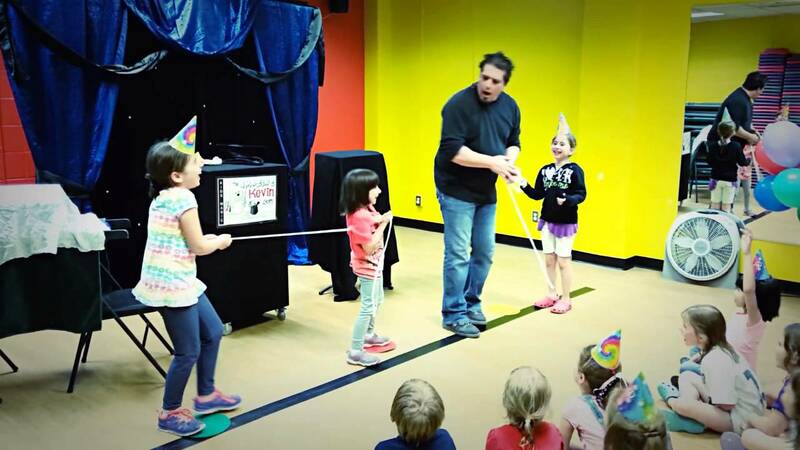 Kevin McGuire offers a comedic magical show for a variety of occasions including children birthday parties, school functions, fundraisers and more! This review is a little late since our son's party was last year, but I hope it speaks to the impression that Kevin's performance left on all those attending the party. Kevin transformed our basement into a magic show stage with beautiful curtains, which set the mood for an exciting show. His tricks were age appropriate but wowed the adults as well. He was friendly, warmly interacted with the kids, and kept everyone's attention for the 45 minute show. I do recommend springing for the live bunny. It's worth the reaction. Overall, a great time had by all and I hope you consider him for your next party. With wonderful kids and a fantastic room full of energy. I truly had a wonderful time. I can't say enough great things about the Amazing Kevin! The show was very entertaining and interactive, the kids loved it. I would highly recommend the deluxe package. Kevin was very accommodating especially when I requested to move the time up by an hour at the very last minute. I would definitely recommend Amazing Kevin for children's birthday parties. My 7 year old daughter and her friends were amazed by his magic and laughed out loud at his sense of humor. He came early to set up and was very professional and even stayed to let each child get their picture taken with the rabbit. Thank you so much for your kind words. I had a wonderful time. Please keep me in mind for any future events. My son and his friends loved the amazing Kevin! My neighbor actually told me that her kids want to have him for their party. I highly recommend him to anyone looking for a unique way to entertain the kids. I truly had a wonderful time. Your kids where wonderful. And thank you for the carrots Gizmo loved them. My teenage son had a shocking, yet wonderful Halloween party with The Amazing Kevin. He put a sword through my son's neck!!! It was awesome! He entertained both the kids and the chaperones with his hilarious and crazy magic tricks. Definitely would hire him again!!! Thank you so much Kendra I had a wonderful time entertaining your son and friends. Thank you again. Kevin is an AMAZING MAGICIAN!!! !You will be in shock and disbelief when you see his show. Everyone will have a great time young and old. We all had a wonderful time and cant wait to see him again at our party next year. Felicia, it was truly a pleasure being apart of your corporate event. And thank you so much for having me. I really had a lot of fun. laughter,amazment, magic and fun. It's a show that will entertain your friends and your family and bring memories that will last. Hi my name is Kevin McGuire and I have loved magic from about the age of seven. The very first show that I had seen about magic, was a Harry Houdini movie staring Tony Curtis as Houdini. After that I was truly hooked! I was fascinated by it, then along came David Copperfield and his grand illusions. I was taken back by the amazing impact magic can have. When I became an adult I really started to study magic on more of a professional level and started performing for family and friends. Then I came across a childrens magician and had a chance to see his show, it made me realize this is something that I needed to do. Performing shows allows me to enjoy life by providing lasting memories for children, families, and friends. I truly have a love for children and entertaining others, it's a wonderful feeling to see people laughing and wondering how's that done, and the child in front goes,'IT'S MAGIC DUH!!' Talk about priceless! That's why I love to wha t I do. I am now the Vice Prisedent for I.B.M Washington DC Ring 50. Here is what is being said about my shows. I just wanted to send a short note to thank you for sharing your time and talents with us and our Chick-fil-A guests. It takes that special "something" to be able to connect with children and families and make them smile the way you do. I guess that must be part of the amazingness!Thank you for all that you did to help create that emotional connection between Chick-fil-A and our guests!Also, I will be sure to share your ideas with our Marketing Director, Ryan Flanders Again, thank you for sharing your amazingness with us! There are so many people that have inspired me to learn more, to do more. With practices and and drive and good role models to follow by, I shall insure my ability to achieve the things I love most in doing, and that is to bring magic to you.